Chelsea owner Roman Abramovich has "withdrawn" his application for a UK visa, the BBC understands.A source close to the Russian tycoon said his application to extend his investor visa had not been refused or denied, as reported in the press.Mr Abramovich, 51, has put plans to build the club a new stadium on hold amid the delay to renew his visa, which expired some weeks ago.Israel has said the billionaire is eligible for an Israeli visa. The delay in renewing Mr Abramovich's investor visa came to light at a time of increased diplomatic tensions between London and Moscow, in the wake of the poisoning of former Russian spy Sergei Skripal in Salisbury. Reports suggest it expired three weeks ago. Mr Abramovich, who made his fortune in oil and gas in the 1990s, became owner of the companies that control Chelsea in 2003.According to the Sunday Times Rich List, he is Britain's 13th-richest man, with a net worth of ?9.3bn.He is reportedly close to Russian president Vladimir Putin.On Thursday, Chelsea issued a statement saying the club had delayed work on the new stadium at Stamford Bridge because of "the current unfavourable investment climate".The estimated cost for the new 60,000 seat stadium has increased to ?1bn after delays, which included a dispute with a local family. 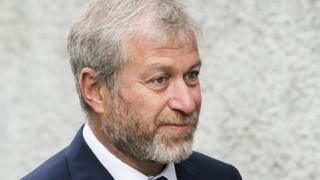 » Abramovich: What's an investor visa?